Below is our updated timetable for week commencing Monday 8th April. We have a new Warrior Circuits class on Tuesdays at 6pm, Jump is a new class on Friday at 9am using trampolines. Our usual favourites are here but a change of day/time for some of them. Cat is back so come and join in her Dancercise on Tuesday at 10am. All classes are suitable for all ages and abilities – great fun and a fantastic way to get fit and tone up. 45m after the name of the class denotes the class is for 45 minutes, some evening classes are 30minutes – others are a full hour. An intense muscle and cardio workout using a barbell. Each of the major muscle groups are worked in turn including chest, back, shoulders and abdominals. This ensures maximum calorie burn and toning as it hits every area of your body. An intense but fun cardiovascular workout that strengthens muscles and helps maintain flexibility. It helps people to build up their fitness level and stamina at their own pace. The routines are fun and easy to follow. A form of aerobic exercise performed in shallow water (swimming pool). While similar to land aerobics, water aerobics is cardiac training but with the component of water resistance and buoyancy. Although heart rate does not increase as much as in land-based aerobics, the heart is working just as hard and underwater exercise actually pumps more blood to the heart. Exercising in the water is not only aerobic, but also strength-training oriented due to the water resistance. Moving your body through the water creates a resistance that will activate muscle groups. 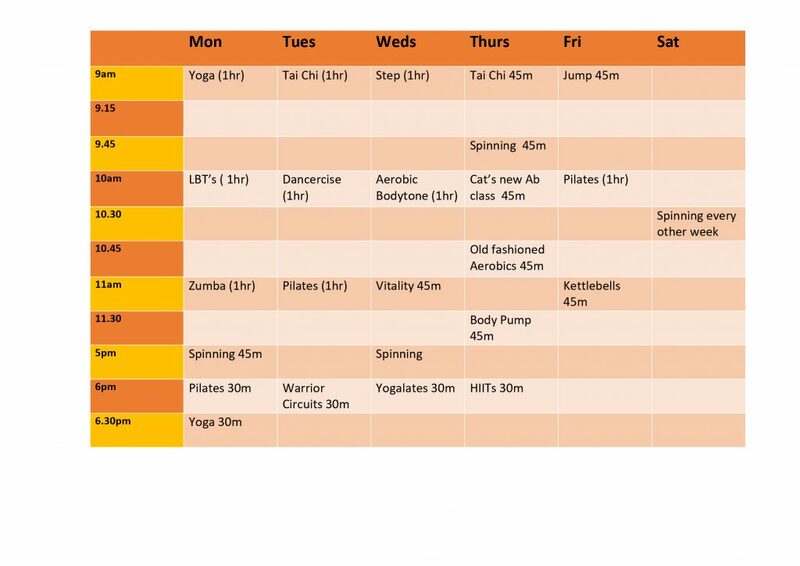 The perfect all round workout, including fat-burning, core conditioning, full body toning, stretching & lots more! Individual and team exercises – great atmosphere and great fun in the sun – on the beach and in the sea ! Pump uses weighted bars to build strength and endurance. This class is designed to include lighter weights with additional repetitions to build muscle tone without bulking up. Each individual decides the amount of weight that is ideal for them. This class offers a terrific way to build muscle and increase bone mass. Punch your way to a perfect physique the fun way. Relieve tension and improve your fitness with this one hour challenge. Using a mixture of boxing moves using punch bag and pads, plus circuits of skipping, star jumps, sit ups, shuttle runs etc. Great for strong core stability, hand to eye coordination, and increased stamina. Combining cardio and conditioning exercises this session provides several high intensity workouts in one class. A great fun, fat burning workout, suitable for all. A cast iron weight shaped like a cannonball with a handle. Kettlebells offer a different kind of training using dynamic movements which target almost every aspect of fitness, endurance, strength, balance, agility and cardio endurance. The beauty of the Kettlebell is that it works many different muscle groups within a single workout. You take the workout at your own pace and (weight level) so it is perfect for any age and ability. The Legs, Bums, and Tums areas are often considered the worst parts of the body when it comes to shifting unwanted fat. Our ‘Legs, Bums and Tums classes are a fun filled way to help tone those wobbly bits. These classes are particularly popular with women who are keen to improve their overall body shape. A mat-based Pilates class works the core muscle of the body, including the deeper muscles of the abdominals, back, shoulder blades and buttocks. The Pilates exercise stretches and strengthens your muscles in a non-impactful, controlled manner. A workout that is focused on the core, with the added benefit of using a balance ball during class. This class is designed with Pilates exercises to challenge the core muscles. Rebounding is a low-impact, fat-burning exercise that improves balance and coordination and is fun and energizing! The workout consists of low level bounces on a mini trampoline. Our spinning classes are non-stop biking but also incorporate a variety of intensity and style. Endurance – trains the body to maintain a comfortable pace for extended periods. Light ride – a slower, lower intensity pedal to gradually build up stamina and endurance. Strength and Recovery – steady, consistent pedalling with heavy resistance and recovery stretches. Try these phenomenal classes for a total body workout that blasts away the fat! As a start, participants work on overall stretching, flexibility, balance and coordination, by learning the “Basics” of Tai Chi. These basic foundation movements will build on physical strength, awareness and concentration levels, thereby promoting stillness within oneself. Using a system of rope and webbing called a suspension trainer allowing you to work against your own body weight. A form of resistance training including bodyweight exercises to simultaneously develop physical strength, flexibility, balance and joint stability while using functional movements and dynamic positions. le on the joints. The workout includes easy-to-follow low-impact movement and upper-body strength, abdominal conditioning, stretching and relaxation exercises designed to energize your active lifestyle. You follow the diet that best suits you – we offer the discipline of a weekly weigh in plus group support and motivation. Offering advice on nutrition we also include a 30 minute exercise session to really help you achieve your goals. A gentle class working all parts of your body to create strength, flexibility, endurance and balance. Creating peace and relaxation in the mind to reduce stress. A perfect blend of Yoga and Pilates exercises working on strength, balance and flexibility focusing on those troublesome areas of abs, hips and waistline. Strengthening the back as well as the core. A dance fitness class including aerobic elements.